I love Ghostbusters. Actually, that’s not strong enough. I LOVE Ghostbusters. I think it’s one of the best movies ever made, thanks to the special effects (awesome at the time), the humor, the action, and the pitch-perfect cast of gifted comedy actors. 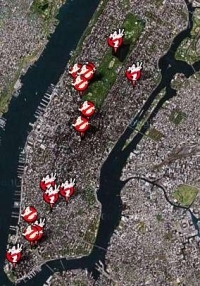 Now, thanks to Ironic Sans’ interactive Google Maps Guide to Ghostbusters, if I ever get to Manhattan I can take a tour of all those awesome locations that color one of my favorite movies. If there was an official Ghostbusters tour, I’d be ALL over that. No question about it. I’ve always wanted to go see the big city, and if I ever do go, this tour is going to be on my list. At the very least, I have to go see the firehouse! Can you believe I’ve never been to New York? I may have missed out on my chance to catch a show at CBGB like I always wanted to, but I could definitely engage in a little tour around the New York City of Ghostbusters! While I’m there, I’ll head across the river and take a Kevin Smith tour of New Jersey, too!